As a leader, we are all susceptible to certain temptations that damage our leadership. Having a temptation does not mean we have to succumb to it, but we are very likely to succumb if we have not explicitly recognized it. 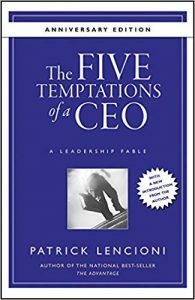 Lets take a look at the 5 temptations of leaders. It can help us lead and recruit better. Further, leaders we hire have temptations of their own and being aware of such gaps helps us to manage them and in our case to propose them to companies to hire. Everyone has a temptation. This does not mean we have to fall for them. Temptation Number 1 is choosing status over results. This is subtle. Hard working junior managers might not show any signs of this but when they arrive at an important position, they begin to show. While as a young worker, they focused on results, they now focus on holding their position. Now they focus on protecting their position. This is super common among Chinese GM’s in China. They will never hire anyone who can hold a candle to them. You go around the factory and every manager is not only a C player but also noticeably more loyal to the GM than the company. See also Hire Force Multipliers. Temptation Number 2, which is my temptation, is choosing popularity over accountabilty. I find I really like to have workers like me. So I work really hard to make them happy, It can mean I fail to keep them accountable which I need to watch out for. Temptation Number 3 is choosing certainty over clarity. This one I call analysis paralysis. When decisions often get delayed, you can know a leader is succumbing to this one. They cannot bear to be wrong, so puzzle a lot. This leaves the team with lack of direction. Further the leader does not want to talk about the decision as afraid to be found wrong, so clarity is harmed even more. It is a big loss. Temptation Number 4 is choosing harmony over productive conflict. Leaders like this are afraid of conflict and so when they propose an idea they place subtle pressure that makes direct reports fall in line and not oppose or critique an idea. This leads to bad decision making as no input is allowed. It further encourages good hires to resign and leave. Temptation Number 5 is choosing invulnerability over trust. These people never want to appear vulnerable. They want to appear as the only genius. They have failed to see that people are drawn to leaders who can say they fell short. Being real which means being vulnerable at times is a base piece for great leadership as at it builds the climate for good teamwork all around. When the boss is busy proving himself, no one else wants to show true vulnerability either. To get good recruiting of great leaders, you need a recruiter who is great at recruiting and filtering but you also need them to know great leadership when they see it. Knowing the 5 temptations of leaders is one more thing we keep in mind.